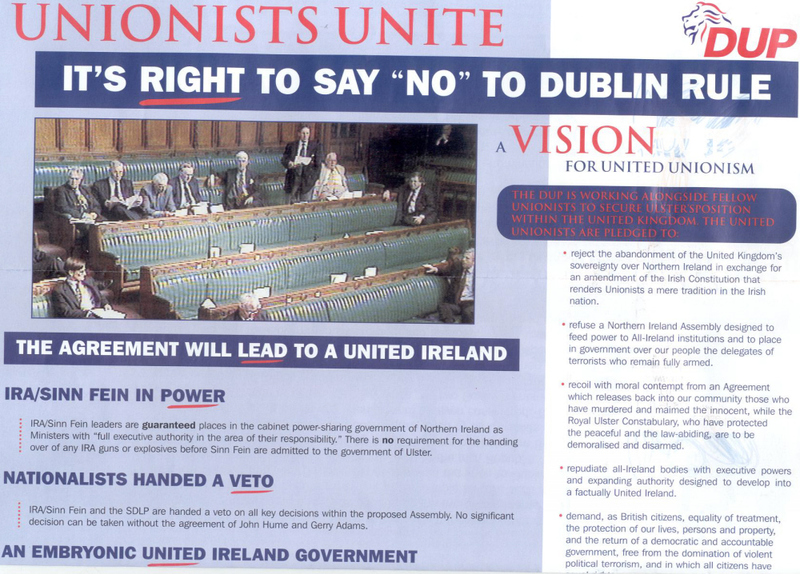 From the 1998 Good Friday Agreement campaign a DUP (or Ulster Democratic Unionist Party as the good Doctor refers to them in his message) leaflet urging voters to vote No to the Agreement. Worthwhile reading all the objections and then seeing how much progress has been made in the last 12 years. 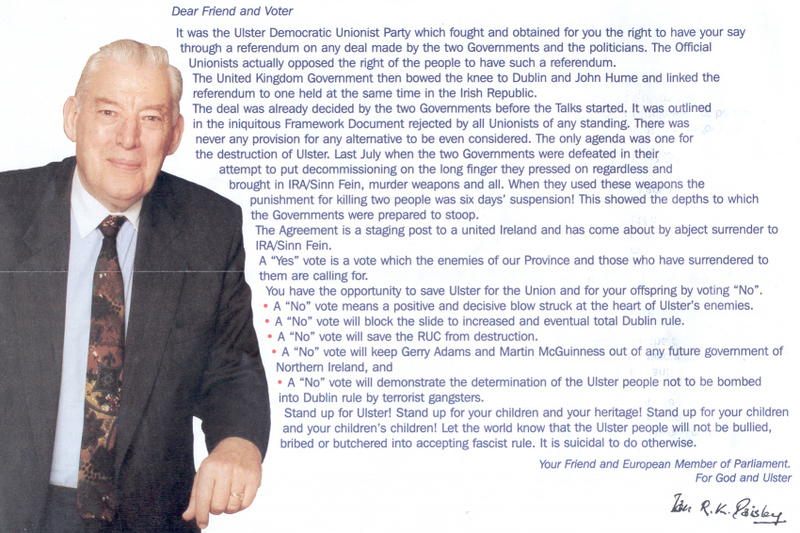 Ian Paisley concludes his ‘Dear Friend and Voter’ message with..
“The Agreement is a staging post to a united Ireland and has come about by abject surrender to IRA/Sinn Fein. A “Yes” vote is a vote which the enemies of our Province and those who have surrendered to them are calling for. You have the opportunity to save Ulster for the Union and for your offspring by voting “No”. • A “No” vote means a positive and decisive blow struck at the heart of Ulster’s enemies. • A “No” vote will block the slide to increased and eventual total Dublin rule. 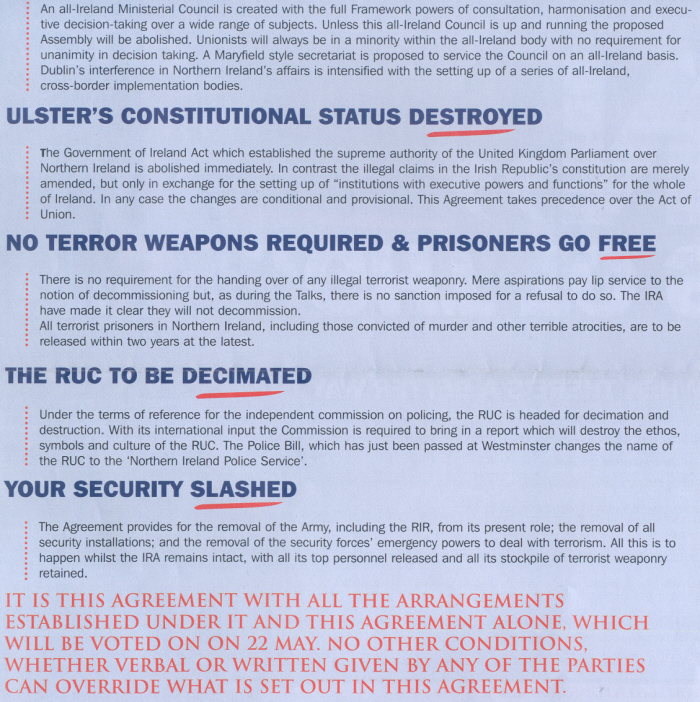 • A “No” vote will save the RUC from destruction. • A “No” vote will demonstrate the determination of the Ulster people not to be bombed into Dublin rule by terrorist gangsters.